Did the VMAs just come to a screeching halt for anyone else, or was that just me? As we were all eagerly awaiting both Beyonce's Vanguard Award performance and the rumored Beyonce and Jay Z divorce announcement, viewers were treated to a surprise appearance by Jay Z and Blue Ivy, who were just casually hanging out backstage, presumably waiting for Beyonce to just as casually walk on stage, nail her performance, and deliver the VMAs' best moment. What does this mean for the whole divorce thing? It's hard to say. 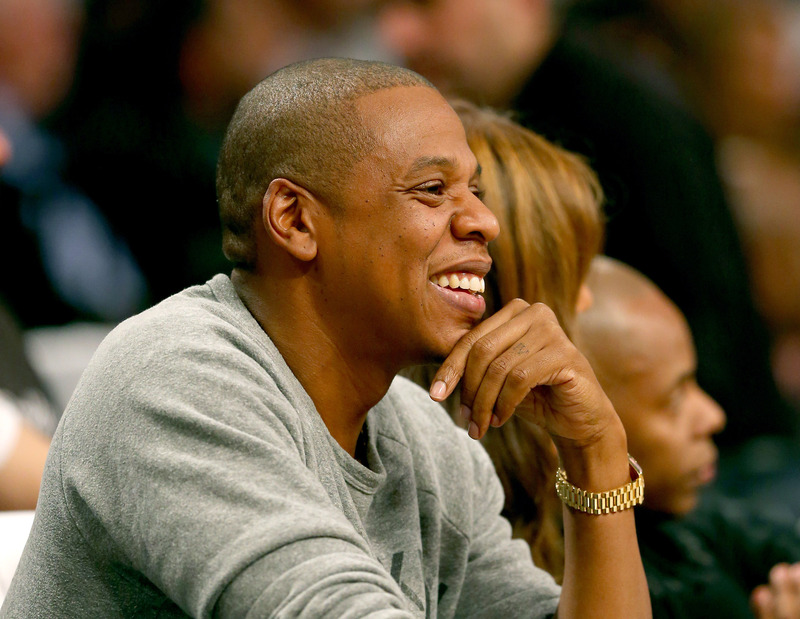 Jay Z's face is hard to read. Is he worried? Is he just confused or shocked by whatever was happening on stage at that moment? Maybe he just caught sight of his strange hat choice in a mirror and is reevaluating every decision he made today. For her part, Blue just looks as adorable as usual, wearing a gold dress with a matching bow in her hair, while holding onto a pair of truly amazing neon pick sunglasses. She doesn't look concerned at all, but I doubt she has any idea what's going on. This is just another day in the life of the daughter of two musical superstars. Check out the photos below and see what kind of meaning you can desperately attempt to read from them. Anything? I know it seems like kind of a stretch to try and predict what's going to happen with Jay Z and Beyonce from a photo of Jay Z hanging out with his daughter backstage, but some of us are really nervous about what's ahead and just need something to hold us over. Knowing MTV, they'll save Beyonce for the end of the show, because she's obviously worth sticking around for, and with the show scheduled to end at 11:30 p.m. EST, it could be almost two hours before we finally see what's in store. That's basically an eternity in awards show time. Personally, I think the fact that Blue is there at all is a good sign. If Jay Z and Beyonce were planning on announcing that they're over tonight, would they bring their daughter? I don't think they would. If anything, maybe they brought her along to show that they're standing strong as a family. No matter how hard we try to predict what's next, I think it's time to admit that there's nothing we can do but wait.